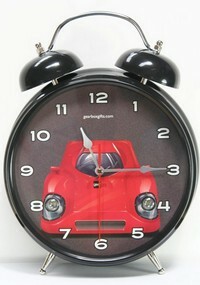 Do you know someone who loves cars but also has a little trouble getting up in the morning? Do they sleep so well, that they're often known to be 'Flat Out' fast asleep? If so, then we have the alarm clock to wake them! Once the alarm sounds, the headlights turn on automatically and you instantly hear the V12 engine fire up - just as in the golden era of sports car racing, when drivers only started their engines when the flag dropped, thereby starting the race. You then hear the car acclerating away, change gear and start running absolutely 'Flat Out'!! Super-sized (23cm wide by 31cm tall) and super sound, it makes a really fun birthday or Christmas gift!